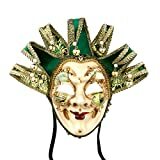 Green Venetian Masks On Sale! 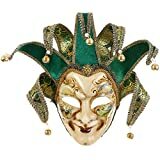 Jester points are bendable, you may adjust to your liking. At the end of each point is a bell and a faux pearl. So elegant for your Party. 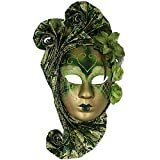 Mask Material: plastic,High Quality Eco-friendly Resin,Cloths. 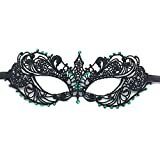 The mask is finished with two black silk ribbon ties.This hanging ribbon hidden at the top,so you can hung this beautiful Phantom Design Volto Mask on a wall as decoration or worn using black ribbon attached on each side of the face.